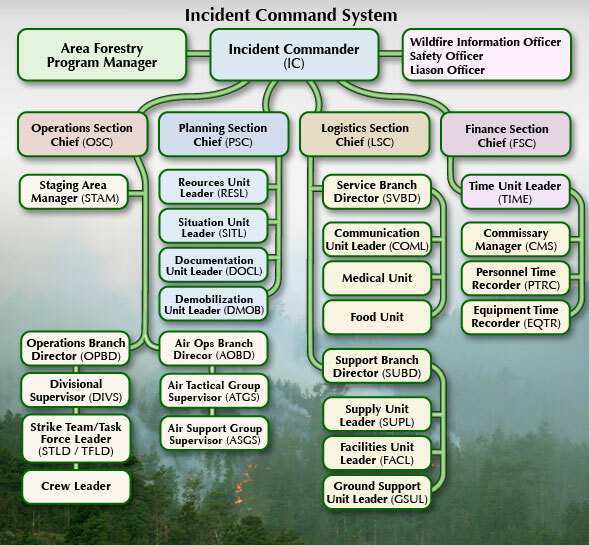 The Incident Command System (ICS) "is a standardized on scene emergency management system specifically designed to allow users to adopt and integrate an organization structure equal to the complexity and demands of single or multiple incidents, without being hindered by jurisdictional boundaries." It is the combination of facilities, equipment, personnel, procedures and communications operating within a common organizational structure, designed to aid in the management of resources at wildfire incident. In 2000, Canada assisted the USA with suppression efforts of some of the worst wildfires the USA had seen in years. This was the first exposure Canada had to the Incident Command System. Exposure to ICS lead to a review of the current fireline organization Canada used for wildfire incidents. It was evident the structure in place was not standardized and did not allow for organizational expansion required for large emergent situations. The Canadian Directors made a decision to implement the ICS by 2003 to ensure a system was in place to manage emergency situations and to assist other agencies if required. Alberta has adopted the Incident Command System and annually reviews its effectiveness on wildfire incidents. Task books for positions have been created and training offered to those who support the incident. Following exchange standards as developed and implemented by the Canadian Interagency Forest Fire Centre, Alberta is able to effectively import and export resources as required.